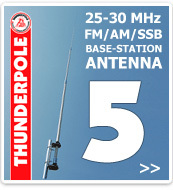 The THUNDERPOLE CB radio shop probably stocks the best range of mobile CB radios, handheld CB radios, CB antennas and CB accessories in the UK. 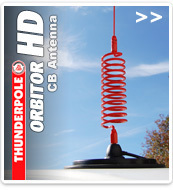 With CB radios for sale from Thunderpole, Midland, tti, K-PO, Cobra, Albrecht and President, and CB aerials for sale from Thunderpole, Sirio, Solarcon, Sirtel and Wilson in our extensive range of the best CB radio equipment. CB Radio (or Citizens Band Radio, giving it it's official name) was legalised in the UK in 1981 as a cost effective and simple means of communications, and at first there were 40 channels available for anyone to use. In 1987 as the airwaves had gotten so busy 40 more European channels were made available in the UK, giving everyone access to 80 channels. In 1997 the law was changed again to allow all 80 channels to be added to the same radio. And then in 2006 the CB licence was scrapped in the UK, boosting it's usage once again. 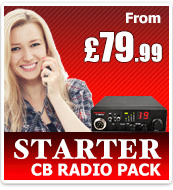 CB Radio is a very effective means of communication between two or more people that can be used by anyone, with no need for a licence, no subscription and no on-going fees. CB radios and accessories are extremely cost effective and reliable, and CB radios can be fitted and set up within minutes, with little or no experience needed. For more information click on our CB Radio Guide. *with appropriate licence for the country visited.